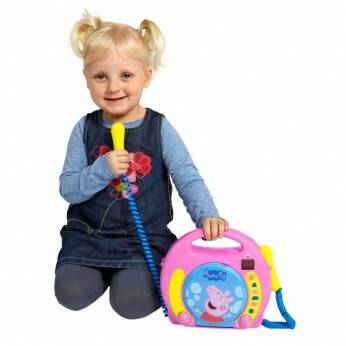 The CD Boombox by Peppa Pig has a pretty design and is very easy to use. Little ones can sing along to their favourite songs like real popstarts. It includes two microphones so a friend can join in too. Dual microphones with volume control; Batteries required: 6 x C; For ages 3 years and over. EAN: 8436539203544: Not suitable for children under 3 years old. * . This toy costs approximately £29.99 (for the latest and best prices make sure you check our retailer list for the Peppa Pig Boombox above). In our review of Peppa Pig Boombox we classed it as being suitable for ages 3 years, 4 years, 5 years but recommend you check the manufacturer specific advice before purchasing.